SNAFU! 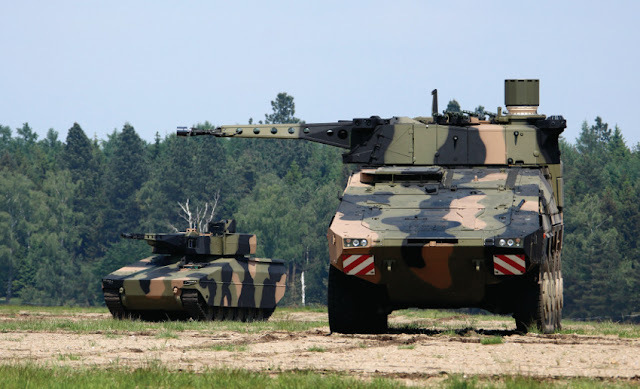 : Land 400 Phase 3 is Rheinmetall's to lose? Land 400 Phase 3 is Rheinmetall's to lose? Now that the Defence Department’s Land 400 Phase 2 decision has been made in favour of the wheeled Rheinmetall Defence Australia Boxer combat reconnaissance vehicle, the next army mega-acquisition — valued at several billion dollars — will get under way later this year. This will be the purchase of 450 tracked infantry fighting vehicles (IFVs) under Phase 3 of the same Land 400 project. These will replace the upgraded 431 M113 armoured personnel carriers in service since the 1960s, and 17 manoeuvre support vehicles for the Australian Army’s combat brigades. For Phase 2, Rheinmetall is investing many millions of dollars in a modern armoured vehicle manufacturing facility in Queensland that can also be used for Phase 3. Additionally, the German-owned company has three possible in-house products: simply offering more Boxers; a recently unveiled IFV known as the Lynx; and another named Puma — the latter through the PSM joint venture with Krauss-Maffei Wegmann. All have their strengths, though the Lynx looks to be the one closest to the army’s requirements. This is for several reasons. The army has always preferred a tracked solution for Phase 3 because these vehicles are more like medium tanks with troop-carrying capability and so tend to have better levels of protection and manoeuvrability than their wheeled competitors, such as the Boxer. The army has also studied the benefits of manned versus unmanned turrets, and has a history of favoring the former. If this continues, it will probably count fatally against the Puma, which achieves world-class performance partly through the use of an unmanned turret. To switch this out would negate many of its otherwise considerable advantages. There only seem to be three other strong IFV contenders. They are: BAE Systems Australia with the CV90; South Korea’s Hanwha Defence Systems with the K21 and the General Dynamics Ajax. There are a number of other possibilities, but they seem either too old or still under development. These companies will all be asking themselves whether they have a realistic chance of success in what is a very expensive bidding environment. The two finalists for Phase 2 — Rheinmetall and BAE Systems — spent about $25 million each on the completion, with Defence paying back about 50 per cent of their costs. It is expected that the cost of bidding for Phase 3 will be double that. If Defence follows the same formula of partial cost recovery, unsuccessful companies might each be looking at a loss of $25m if they respond to the request for tender that will be released in the next few months. Did the Aussie Army practically paint themselves into a corner with the way they did the Land 400 Phase 2? If this article is correct it sure looks like it.